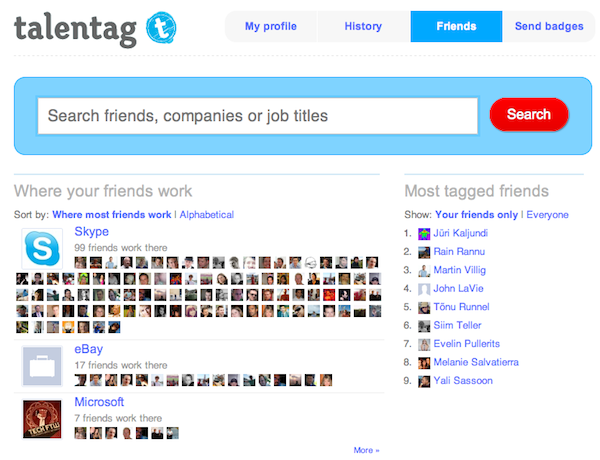 We’ve made all Talentag users even more irresistable by redesigning how everyone’s profile looks. We had added features and profile elements over time and this meant that it was difficult to get a sense of someone at a first glance, which many of you pointed out as well (please, do keep the feedback coming). So we redesigned the profile to show the most important things about you at the top area of the page. As you can see we’ve also added something called Talentscore, which is everything you’ve ever accomplished, done and tagged, manifested in one number. It looks at which tags you’ve received, from how many people, from who and about seven other things. Why not go see what’d you Talentscore? See your profile. 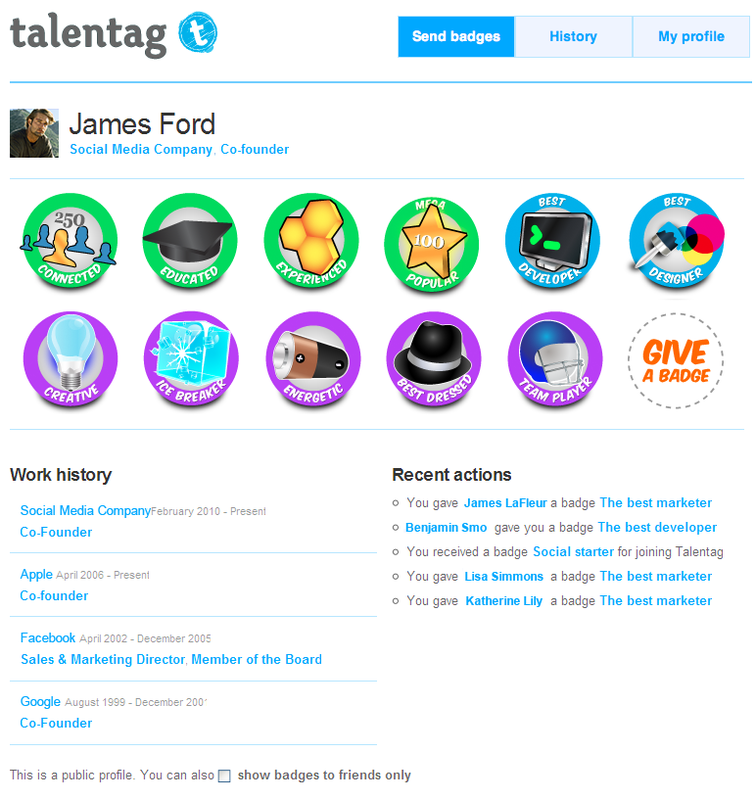 Key part of your Talentag profile is a professions badge, which describes what do you do at work. Make sure you have one. Now on you can claim it yourself and make it easier for friends to vouch and agree to that. 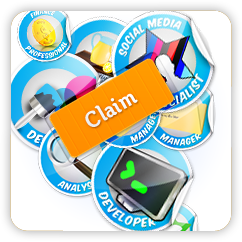 Click the “Claim a badge” action button on your Talentag profile and claim one or more professional badges that define you as a person. Here’s a shortcut to the claim page. Did not find a badge that describes you? Let us know and we might add one in the future. Vouching on other persons work history item is a nice way to say you like what they did at a position. Check whether your Talentag work history part is filled in and up to date. Company names and time periods are used to automatically say you’re a colleague with others on your icons. 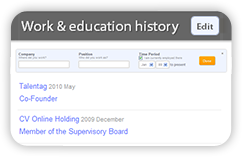 To add or change positions, click the “Edit” button on the Work & Education History section of your profile. You can either add positions manually or just import your LinkedIn or Facebook work history. 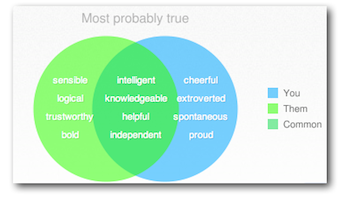 A great way to understand how others see you is to ask custom work- or personality-related questions on Talentag. You could ask literally anything – but we recommend you stick to professional topics. Answers can remain private or be a part of your public profile, you choose. We’ve now made it easier to ask your own question from your network, right on our homepage or Get Feedback tab. We’ve found that friends and co-workers tend to give you more badges, tags and vouches when you actively ask for them. 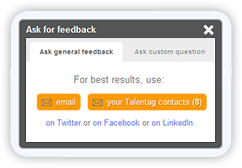 Simply choose the Get Feedback link from Talentag top menu and ask. You can use either your e-mail or Talentag contact list. 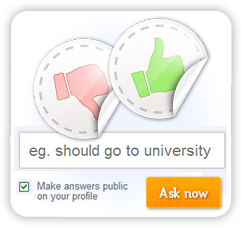 Alternatively, you can use Twitter, Facebook or LinkedIn to share your feedback request. 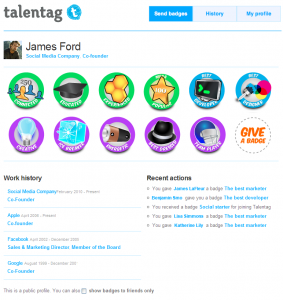 Why not show off your Talentag badges and ask some questions right on your blog sidebar or personal external website? Head to the Settings page’s Widgets section and you’ll find 2 widget types there. First allows to show all the badges you’ve received, or select just a sub-section of them. The second is a questions and answers widget that allows the visitors of your website to give Yes / No answers to personality questions about you. Get the widget codes here. We’ve added a nifty little feature that lets you compare your tags to those of your friends or peers. Now you can see which of your perceiver personality trairs are unique to you, which ones you share with either your friends or people in your field and which ones you miss out on. We’ve also refreshed the design of your home screen and friends page. You can now see the most popular badges and tags among your friends, for example. If you haven’t logged in in a bit, go tag some talented friends. Remember, the more tags your friends and yourself have, the more useful these comparisons become. We’v e been talking a lot recently. We’ve had conversations with lots of users, social media specialists and just really clever people and asked for feedback on Talentag. Many have said that badges and tags are great for many things but they don’t give you real feedback on how you are perceived. We did a little bit of home reading and are now taking tags a little bit further. Instead of just giving and receiving verbal tags you now have a ‘taggregator’ (not a scientific term, yet) that lets you compare how different people perceive you, and how this differs from your self-image. It’s based on Johari window which is a cognitive psychology tool that’s been tried and tested for decades. Basically it gives you 56 words that you and other people rate as matching to you or not, and which produces a nice overview as a result. You can also add your own words eg. ask whether people think you are entrepreneurial, or whether you look live Elvis. May I warmly recommend to try it out – just a word of warning that it’s somewhat addictive. You can start by answering questions about yourself and letting others give their view later, or by plunging in and tagging a couple of friends to start with. Would love to hear your thoughts and feedback! Sending badges has by far been the most popular activity on Talentag and we’ve added new badges almost every week – most of them have been requested by our users. This has been nicely complemented by badges that people receive in the process, the so-called game mechanics badges like Popular for receiving a certain number of tags or Generous for tagging others (our game mechanics deserves a standalone post one of the days). We think badges will have many more creative uses, first of which is event badges like Seedcamp Week Winner or MacWorld 2011 Exhibitor. It’s a way for event organizers to promote their event and for participants to form a ‘visual hashtag’ that helps to connect with like-minded people and doesn’t look too shabby on one’s social CV. 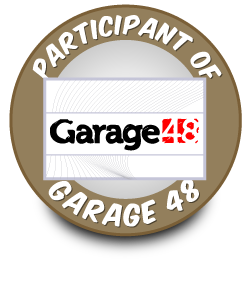 Our first ever event badge was for Garage48, the Estonian startup event. There was the public badge that any participant could claim, and the Garage48 Winner badge that was exclusively given to members of the Defolio team. The winners, that is. We’ve created three kinds of event badges. First are badges that anyone with a Talentag account can claim – think SXSW participant. Second category is subtly different – it’s semi-public badge where the link to the page where a badge can be claimed is only available from event organizers. This is suitable for smaller or slightly more exclusive events – think TEDster. Thirdly there are badges that cannot be claimed; instead, event organizers can choose who they want to give them to. Think I went to Davos 2011. While Davos organizers may have little to win from creating Talentag badges we think it would be a badge that most participants would proudly wear on their virtual lapel. If you’re an event/conference organizer and would like to trial event badges please do get in touch via email or via the Custom form on the Send badges area. We’ve changed the History tab in Talentag with today’s release, I mean. It used to be you could only see the last thirty or so something lines of recent activity. The new one not only scrolls to infinity but allows you to sort history by everone’s, your friends’ and your own activity only. If you want to keep an eye on someone you have not friended on Facebook (or because you haven’t imported your friends list yet for one reason or another) you can now follow them on Talentag. This way their new tags and vouches shows up in your recent activity feed on Talentag and in the weekly email we’ve started to send around. Very much like with Twitter they may but don’t have to follow you back. Go to someone’s profile and see what tags and badges one has received or sent recently. This area is called Recent activity rather descriptively. Go to your Settings page and customize how you and others are notified of your new tags or vouches. You can also change your name and such there. Click on the small number next to badge in someone’s profile and see who has been that generous person that sent it. Use Talentag without experiencing some of the annoyances and bugs we’ve killed. That’s it for this time. If you spot anything fishy or could really use a new feature, you know where to find us. There’s always the chance that this app will go the way of the spammy virtual badges like Pass a Drink. But if the app is used as it’s intended, it could be a nice, quick way to see where your strengths are and to let friends and coworkers know theirs. Wouldn’t it be nice to wake up and see that your project manager thinks you’re ultra Creative? So Talentag will help to understand who’s who on Facebook from professional point of view. Think of it as fitting LinkedIn into Facebook. As such it nicely complements the Emply offering. 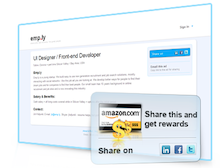 In the future highly rated Talentag users can opt in to receive job offers from Emp.ly advertisers, or they can choose to earn rewards for finding suitable job offers for their friends. We’ve been live for a couple of days: number of badges sent has been nicely increasing, there’s been positive feedback and some useful observations. Please keep the feedback coming either as comments here or on Twitter. We know finding good people can be a bit tricky at times. We also know that money is tight in this economy, especially for startups – this is why we launched Emp.ly in the first place. And this is why we’d like to allow small companies and startups use Emp.ly Premium for free. Not only makes it super easy to post jobs onto social networks and see sharing stats, it also provides an incentive for people to spread the word. So if you have an opening we’d like to offer you one $10 Amazon gift gard that will be raffled among everyone that shares and/or retweets your job posting. Emp.ly’s cutting edge analytics and lottery engine will also be free as part of the trial. Sign up for the free trial. PS. We’d like to offer this to as many startups as possible but due to budget constraints we have to be somewhat selective. We’ll send access to 10 first and hand pick from there on. So please don’t get mad if we won’t be able to send you the beta link right away or at all.